Newly adjusted Title 24 standards are core to the interests of any developer or architect committed to effective building strategies in California. With these new standards, the state maintains its leadership as a forward thinking advocate of safe, sustainable, energy-efficient construction. This digest summarizes the changes in Title 24 standards for both residential and non-residential standards, slated to go into effect with the 2019 regulations. On the residential side, the standards require solar photovoltaic systems for new homes. They also encourage demand-responsive technologies, including battery storage and heat pump water heaters, and improve the building’s thermal envelope through high performance attics, walls, and windows to improve comfort and energy savings. For the first time, the standards establish requirements for newly constructed healthcare facilities. Healthcare facilities overseen by the California Office of Statewide Health Planning and Development must comply with applicable requirements from California Energy Code 2019. There are exemptions added for healthcare to avoid potentially conflicting requirements for healthcare facilities. In nonresidential buildings, the standards update indoor and outdoor lighting, maximizing the use of LED technology. For residential and nonresidential buildings, the standards enable the use of highly efficient air filters to trap hazardous particulates, from both outdoor air and cooking, and improve kitchen ventilation systems. Homes built in 2020 and beyond will be highly efficient and will include photovoltaic generation to meet the home’s expected annual electric needs. Smarter buildings perform better and affect the grid less, thus the standards also include voluntary options to install technology that can shift the energy use of the house from peak periods to off-peak periods. In 2008, California set energy-use reduction goals targeting Zero Net Energy use in all new homes by 2020 and commercial buildings by 2030. The goal meant that new buildings would use a combination of energy efficiency and distributed renewable energy generation to meet all annual energy needs. California’s energy landscape has changed since 2008. Two important policies – the Renewables Portfolio Standard (RPS) and net energy metering (NEM) rules– affect the value of rooftop solar generation. The RPS requires utilities to have 50 percent of their electrical resources come from renewables by 2030. As a result, electricity produced for the grid is already much cleaner than 10 years ago. NEM rules limit residential rooftop solar generation to produce no more electricity than the home is expected to consume on an annual basis. If the home generates more, the surplus is compensated at much lower than the retail rate (a difference of $.10 a kilowatt-hour or more). The Energy Commission’s standards must be cost-effective and bring value to the grid and environment. Since the grid is cleaner, and residential rooftop solar customer compensation for over-generation is limited, it is critical that rooftop solar generation does not substantially exceed the home’s electricity use. It is ideal to generate the electricity and use it onsite, rather than exporting it to the grid when it is not needed. When the rooftop solar generation is used entirely to offset on-site electricity consumption, then the home has virtually no impact on the grid, reducing the home’s emissions. Looking beyond the 2019 standards, the most important energy characteristic for a building will be producing and consuming energy at appropriate times and responding to the needs of the grid. Single-family homes built with the 2019 standards will use about seven percent less energy due to energy efficiency measures. Once rooftop solar electricity generation is factored in, homes built under the 2019 standards will use about 53 percent less energy than those under the 2016 standards. This will reduce greenhouse gas emissions by 700,000 metric tons over three years. Nonresidential buildings will use about 30 percent less energy due mainly to lighting upgrades. The 2019 standards will increase the cost of constructing a new home by about $9,500 but will save $19,000 in energy and maintenance costs over 30 years. Based on a 30-year mortgage, the Energy Commission estimates that the standards will add about $40 per month for the average home while saving $80 per month on heating, cooling, and lighting bills. Compiled from California Energy Code sources by Ying Wang and Lance A. Williams of Okapi Architecture. Okapi has been conducting Title 24 training on behalf of the Southern California Gas Company and Southern California Edison since 2016. 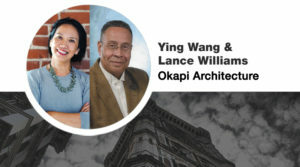 Ms. Ying Wang, AIA, LEED Fellow, President of Okapi Architecture Inc., has an impressive thirty plus years in architecture, program management and teaching. Lance A. Williams, Ph. D., LEED AP, is a Partner in Okapi Architecture and previously served as the first Executive Director of USGBC-LA.